If you’re like us, raising chickens is a rewarding experience. For over a century we’ve been shipping boxes of fluffy day-old chicks to farms, homesteads, and even urban homes across the country. Our team carefully hand-packs each order carefully in our custom shipping boxes, along with some Gro-Gel™ and heat packs when needed, to ensure each chick is safely delivered to its new home. In addition, we are committed to being a trusted resource for our customers to help them get the most out of their flocks — from our help-line, online forums and blog articles to our extensive line of poultry equipment and merchandise, we are dedicated to helping you raise a healthy flock. Whether you are new to raising chickens, or just need a refresher, we have compiled some basics to help you prepare for their arrival and get your flock started correctly. In addition, we have created a free, handy Getting Started download to print and use as a reference. When your chicks arrive, they will need access to water, feed, and heat. The first thing you will need to do is set up a brooder. This will be the home for your chicks for their first four to six weeks. Select a location that is free from drafts and predators. A brooder can be as simple as a large box or galvanized bin, or you can purchase a complete starter kit or commercial brooder. Whichever you choose, make sure your flock has plenty of room — at least one-half square foot per bird to start — and that the sides are high enough to keep the chicks in, and drafts and other animals out. Keep in mind that as your chicks grow, you will need to expand the size of your brooder. Fill your brooder with a one-inch layer of wood shavings, rice hulls, or ground cobs. We do not recommend using use cedar chips, sawdust, or treated wood chips. Sand, straw, or dirt will also do, but make sure to keep the area free from moisture. For the first day or so until the chicks are accustomed to their feed, cover the bedding with newspapers. Remove the papers after the first day for heavy breeds and meat birds and after the third day for lighter breeds. You will need to keep your chicks warm for the four to six weeks they are in the brooder, so you will need a thermometer and a heat lamp. 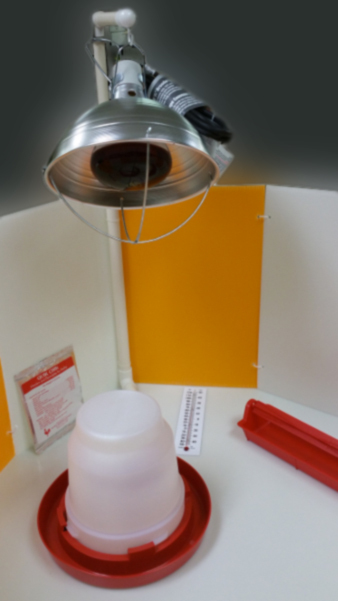 We recommend hanging the lamp 18 inches above the floor of the brooder, and using a 250-watt red bulb. This will keep your chicks warm enough, and red bulbs are better than white as they cause less picking. Other items you will need include a chick waterer, feed tray and plenty of feed on hand. A one-gallon chick waterer will handle up to 50 chicks. A 20-inch chick feeder will hold five pounds of feed and will accommodate up to 25 chicks. When selecting feed for your chicks, look for a starter feed — a protein-dense feed designed to meet the dietary needs of baby chicks. Chicks will live on a diet of starter feed and water for the first four weeks of their life before progressing onto grower feed. Certified organic feeds, including starter feeds, are available on our website. However, any commercial starter feed will do as long as the protein content is high enough. When selecting a chick starter feed, look for a protein count of 18% for chicks or bantams, or 22% for heavy meat birds such as Cornish X Rocks. About three days after your chicks arrive, sprinkle a small amount chick grit on their feed daily. Make sure you have grit specifically for baby chicks, and avoid putting too much on as the chicks will fill up on it instead of feed. Baby chicks ingest the remaining yolk sac from the egg when they hatch. That gives them the nutrition they need for their first 72 hours while they are shipping to their new homes. When your chicks arrive, remember they have had a long journey and will need water and the warmth of the brooder right away. To ‘teach’ your chicks how to start drinking and show them where to find their water, GENTLY DIP THE BEAK OF EACH CHICK IN THE WATER BEFORE YOU TURN IT LOOSE in the brooder. For best results, add either Quik Chik — or Broiler Booster for meat birds — to their water. Quik Chik is a combination of vitamins and electrolytes that you add to their drinking water right from the first day. It will help overcome shipping stress, and get them off to a good start. One 4-ounce package takes care of about 200 chicks for two weeks. If you order Quik Chik with your chicks, we can send the packet in the corner of the box that your chicks are shipped in. Never let your chicks run out of water — most baby bird loss is caused when the bird doesn’t eat or drink. HATCHERY HINT: If your chicks have had a hard trip and are looking weak, instead of using the standard feed and water suggestions, try putting six tablespoons of sugar in each gallon of water. You can also try to mix some of this extra sweet water with some of your feed to make a soupy mix. Give your birds this special feed and water mix for 3 to 4 days to get them over the effects of shipping. Once your chicks are shown their water, add them to the brooder. Keep the brooder at 90 to 95 degrees for the first week, then reduce the temperature five degrees per week until you get to 70 degrees. By then, they should have their feathers in and ready to move out of the brooder. 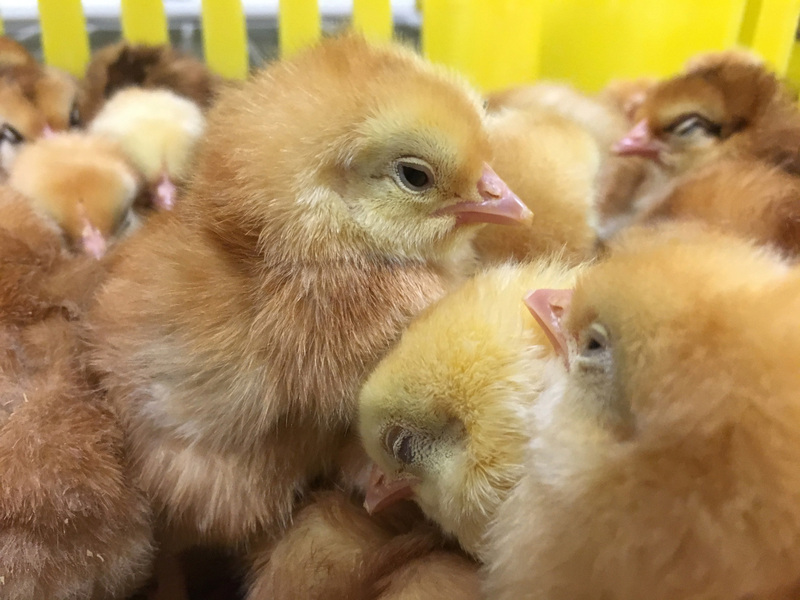 Keep an eye on how your chicks behave — they should be exploring all around the brooder. If they crowd together under the heat source, they’re cold so lower the heat lamp or add another. If they appear to be avoiding the heat, they may be too hot so raise the heat lamp. A general rule of thumb is to use one bulb per 50 chicks in cold weather, and one bulb per 100 chicks in warmer weather. In addition to heat and warmth, make sure your chicks have light, including at night to keep them from piling. HATCHERY HINT: Baby birds will often pick each other if they are too hot, crowded, or lacking fresh air. Occasionally bright light can also cause them to pick, and sometimes they pick for no apparent reason. To stop this behavior, try putting in fresh green grass clippings several times a day, and/or darken the room. Treat birds that have been picked by smearing pine tar or other anti-pick remedy on the injured area, and separate the injured bird(s) if needed. When your chicks are four to six weeks old, their feathers will start to come in and they will require more space so you will need to make some adjustments to their brooder. Increase their floor area to ¾-square foot per bird. Increase your feeders to two and a half to three inched of space per bird, and increase waterers to one 5-gallon fount per 100 birds. This is also the time to switch them from chick starter feed to a grower feed, and increase the size of the grit used (check with your local feed store for recommendations). Install roosts at the back of the brooder area, allowing four inches per bird, and weather-permitting open windows to allow in fresh air during the day time, and leave partly open at night. If your chicks are stronger and active, and weather permits, you can start allowing them to free range and forage outdoors in an area protected from extreme weather and predators. Bring them in each night and eventually they will learn their routine and naturally come in at night on their own. Raising chickens can be a rewarding experience for the entire family. Many breeds will start laying eggs at just 20 weeks old. We hope this article and our free Getting Started download helps you get your new flock off to a good start. If you have further questions, check out the user forum on our website where poultry owners connect with each other on best practices, tips and sharing ideas. This upgraded kit has everything you need to start your chicks but the feed and bedding. This set-up is great for reusing over and over again and it is large enough to handle 25 chicks for two weeks. Add the Chick Starter Home for more panels to expand as your chicks grow. Panels fold flat for easy storage. Includes all of the following. 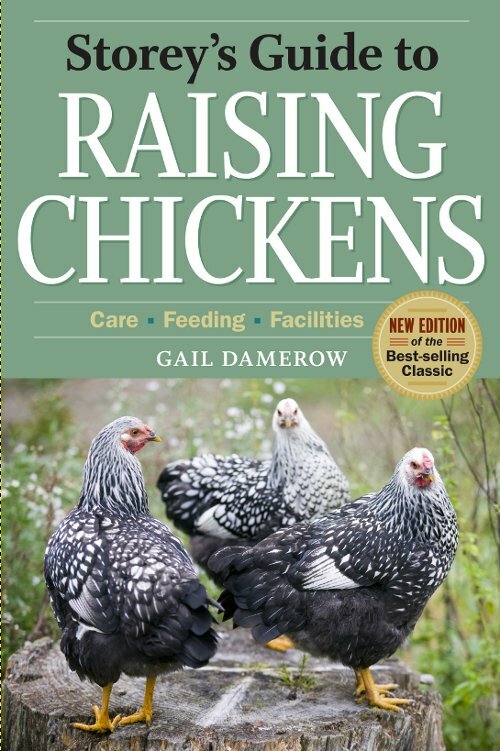 Storey’s Guide to Raising Chickens has all the information you need to successfully keep chickens, from choosing breeds and hatching chicks to building coops and keeping birds healthy and safe from predators. This thoroughly revised third edition contains a new chapter on training chickens and understanding their intelligence, expanded coverage of hobby farming, new information on avian influenza and fowl first aid, and much more.